Did you leave your last audition and put your head right into a paper bag? Auditioning Can Be Fun. No, Really. You know you've got what it takes. Yep. It's hard work. It's also fun. And to get to the fun, you have to do the work. With the right prep, you'll enjoy the audition experience. You'll feel confident, on your game, fully present and in the moment. And those previously scary-to-you people standing behind the camera and sitting at the table will get what you're doing. You'll be connecting. You'll be having fun. You'll be at ease. Get a Dual Perspective from an Industry Pro. I've been there. I've even left an audition with my head in a bag. 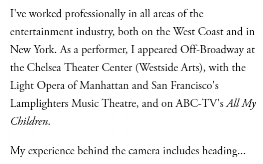 I've also spent time on the other side of the footlights, as a former talent agent and casting professional. Let me give you a dual perspective on the ins and outs of auditioning and show you the difference between what just works and what really wows. And while you're at it, pick up a few tips on the biz, along with a little career guidance and support in pursuing your dream. Check Out My Showbiz Bio. I also love actors and singers. I was an actor and singer myself, so I understand what it takes to launch and sustain a career. I've pounded the pavement in New York City looking for an agent, and I once sat in a comfy chair being an agent. Like most actors, "what I really want to do is direct" so I've staged a few shows. In addition, I've taught and coached some wonderful performers, helping many of them achieve their dreams. And at one time, "real people" casting kept me busy running through malls and bowling alleys, discovering non-actors to star in national TV commercials. Today, I continue to coach and am the Founder/Director of the all-girl theatre program, Remarkable Girls.